3:00 p.m. La Querencia is the birthplace of an alta cocina (haute cuisine) movement known as Baja Med—a fusion of local ingredients, Mediterranean techniques, and Asian influences. While this culinary style may seem like an unlikely amalgam of flavors and cultures, it actually makes perfect sense considering the history of Baja and its diverse inhabitants. 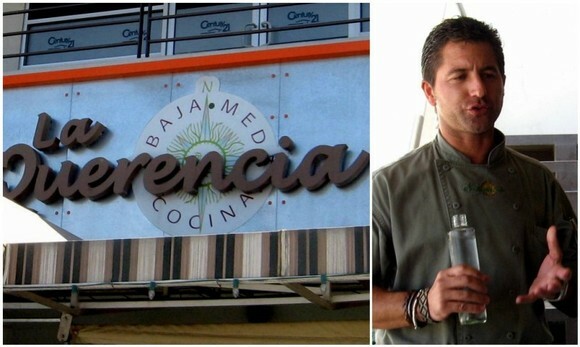 Miguel Angel Guerrero Yagües (pictured above) is the chef behind the Baja Med movement. A fourth generation Baja dweller, Chef Yagües runs a number of restaurants in the region and is an avid hunter, fisherman, diver, and farmer. 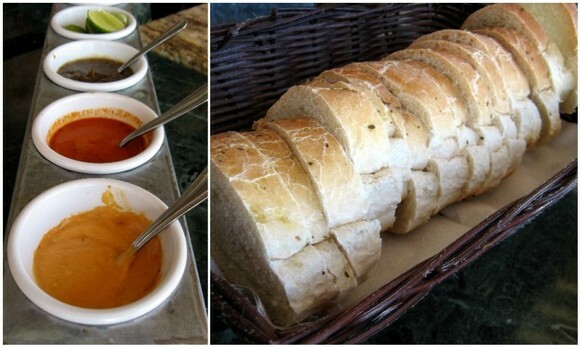 Our meal at La Querencia began with a loaf of bread served with a selection of spicy sauces. Each one contained a unique combination of chillies and aromatics designed to test our toughness and whet our appetites. From bottom to top—habanero, chile de arbol, and tomatillo. 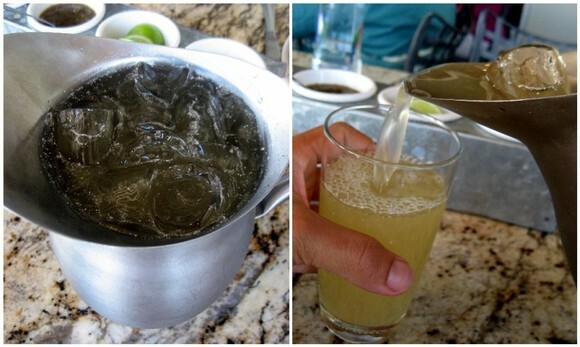 We were also served a refreshing tepache, a fermented pineapple-based drink sweetened with brown sugar and beer. The tepache wasn’t very alcoholic because it was only fermented for three days. It was super-cooling though. Next, a trio of carpaccio arrived; each one was a feast for the eyes and mouth. The beef tongue carpaccio (lengua – top) was sliced paper-thin, drizzled in a luscious olive oil and sea urchin cream, and topped with crispy fried onions. The zucchini carpaccio (calabasa – bottom, left) was dotted with a smoked chili confit, shards of cheese, and capers. The beet carpaccio (betabel – bottom, right) was dressed in a vinaigrette and adorned with chives and a pungent blue cheese. With many of La Qurencia’s herbs and vegetables grown by Chef Yagües on family land, it was no surprise that the trio of carpaccio tasted amazingly fresh. 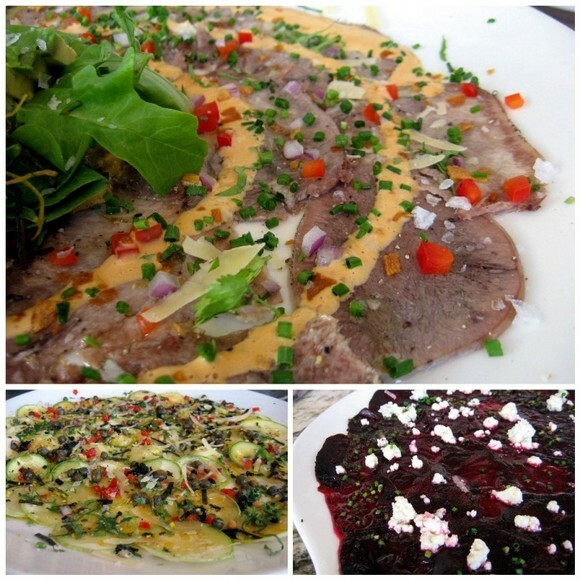 Seasonality and superior local ingredients are two of the driving forces behind the Baja Med movement. Flanked by the Sea of Cortez on the right and the Pacific Ocean on the left, Baja has access to some of the finest and most varied seafood around. 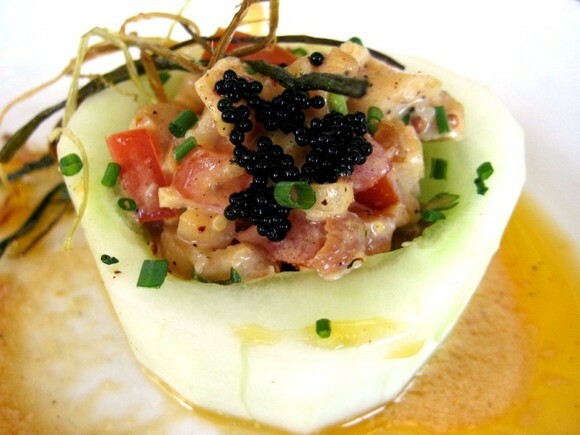 Chef Yagües surprised the group with an off-the-menu creation of local scallops (callos Catalina) stuffed inside a hollowed-out cucumber, topped with sturgeon caviar, and dressed in a chipotle sauce. The flavors were pleasantly mild and clean; great seafood needs little to shine. Our final course was a yellow cherry tomato and a slightly overcooked shrimp perched upon a corn cake and garnished with a ground chili sauce. Two point five words to describe the dish? Bobby Flay-esque. Is it haute cuisine or HOT cuisine? That chef looks just as delicious as the food! This food looks incredibly fresh and delicious. You always find the best places, and I always LEARN something whenever I read your posts. Like tepache – never heard of it. But it has pineapple and beer in it, so it has to be delicious. And what I love most about fusion – that you can see ingredients like caviar included in Mexican dishes. Those little black balls looked so fresh, I’ll bet they crunched and exploded with flavor when you bit into them. Looks fabulous. And I’m with Diana – what a handsome man. This is a great series. We’ve just returned to the Land of Bourbon from England/DC, so I’m behind on commenting, but I’ve been reading it all. Diana – TJ is the land of impossibly attractive chefs. You’re really gonna dig the chef from Villa Saverios! Hubba hubba! Phil – All the credit for finding these hidden Baja gems goes to Bill Esparza of Street Gourmet LA. He knows all of the city’s tasty secrets. And yes, the caviar were so, so perfect! I hope you make your way down to Baja! Fiona – So glad to have you back, woman! I missed your insights! Sook – Believe it or not, I’m barely a third of the way through. We ate 18 meals in 2 days! I’m still recovering from the madness. I guess he must have opened a restaurant after competing on season three of So You Think You Can Dance! wow, lengua carpaccio with sea urchin cream topped with fried crispy onions almost sounds delicious except I’m wondering about the texture of raw tongue? 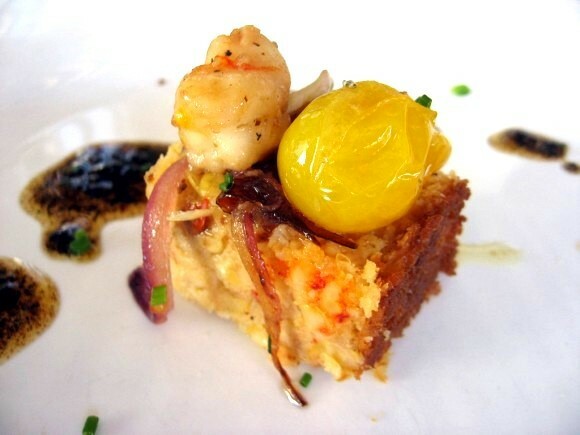 the toppings sound mouth watering… what a feast, who knew such exciting and innovative meals were going on in baja?